Dental hygiene has evolved one step further. Contemporary society requires tooth cleaning to be time efficient. Manual toothbrushes therefore become obsolete, replaced by mechanical ones that are themselves becoming more and more cheap and disposable. One new toothbrush will last you much longer and is about as time efficient as possible. The Blizzident toothbrush promises to clean your teeth in six seconds – a large departure from the minute or so you waste with your electronic toothbrush. 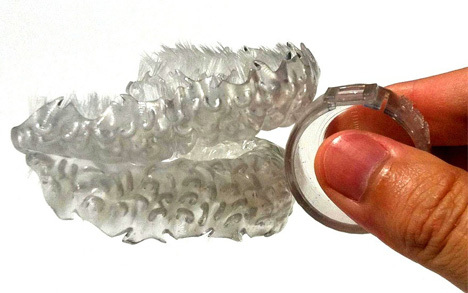 Resembling an athletic mouth guard, it’s 3D printed after the mouth impression you get from your dentist is digitized and sent to Blizzident. The substantial price of $300 may deter some, but if it can get your kids to brush their teeth twice a day, it might be worth it. See more in Various Gizmos or under Gadgets. October, 2013.